Late January 1937 brought record high water along the Ohio River in Gallia, Mason and Meigs counties, including the second highest crest on record in Pomeroy at 67.80 feet on January 28, 1937. The 1937 flood crested just one foot shy of the 1913 flood, according to records from the National Weather Service. 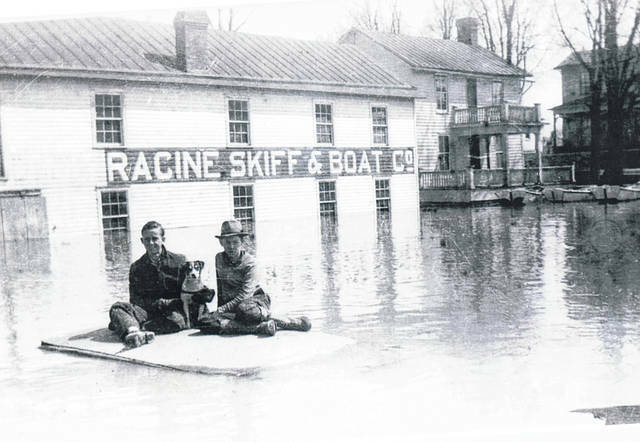 This photo from the Collection of Bob Graham shows Floyd Hoback, Lawrence Willdone, and a dog in Racine during the 1937 flood. Racine Skiff & Boat Co. visible in background. Photos like this one from Graham are available for viewing through the Meigs County Library website and at the Meigs County Historical Society and Museum.